I'm really terrible at thinking up blog titles. Anywho, here's some recent freelance and personal stuff! Someday, I will remember to update my blog more than once every two months. Until then, here's some various stuff. Newer to older, from the past few months. I'm in the process of moving from the SF Bay area up to Bellevue, WA. After that, I'm hoping to stick with some more regular updates as I prepare for Illuxcon. It's been a pretty crazy week, but also a very, very awesome one. I may have some really great news to post soon, but until then it's just the finished image from Mike Bierek's illustration class. This one changed quite a bit since the original sketch, but I think it was for the better. I learned a hell of a lot about light and color, particularly when it comes to using saturation selectively. Now back to thumbnails and onto the next one. Another round of head painting over at Safehouse. Tonight I had the awesomely awesome Kemp Remillard giving me some advice and helping me fix what was (and still sort of is) some super messed up facial structure. Like all portraits, this eventually descended into yearbook-style doodling of Hitler mustaches and devil horns, but here's what came of it prior to that. And the aforementioned Mi-go from the Art Order Lovecraft Creature Lab challenge. This was something entirely new for me. I've never been strong at creature design, largely due to a lack of practice. But joining in on this was one of the more fun art experiences I've had lately. The Art Order community as a whole is both extremely welcoming and helpful, and I'm extraordinarily happy to be able to be a part of it. More work on this guy, and a 3-hour portrait (2:15 without including the breaks for the model) from Tuesday night head painting over at safehouse. I will have a Mi-go concept to post tonight. Putting the finishing touches on it for the ArtOrder challenge. Thought I'd post the WIP that has come from the thumbnails posted before. I recently finished my entry for Blizzards Blizzcon fanart contest, but won't be able to post that one up until October 22nd after they announce the winners. Fingers crossed! We've started up illustration class again with Mike Bierek, which involves going through the various steps of creating a solid illustration with critique each week along the way. For this one, I decided to keep plugging away at my portfolio for Blizzard and work on a piece for one of my dungeon bosses, Lord Xavius. 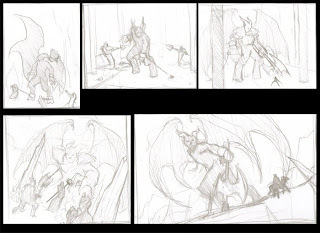 The first part of the assignment was to do a set of very small, fast thumbnails which were readable at first glance and focused on composition. 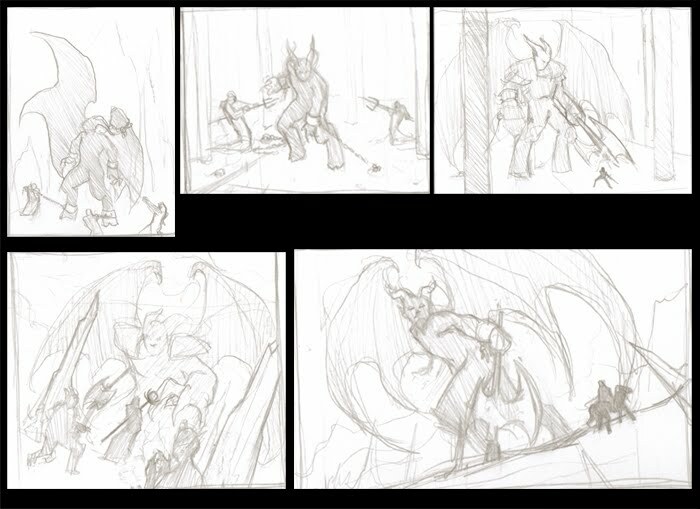 The second part was to pick some of those thumbnails to take to the next level; larger linework thumbnails. - The low camera angle gives Xavius the large "boss" feel I'm going for. The purpose of this illustration is to showcase him as Big Bad Guy, and I think #1 does this best. - The wing and rock shapes give the "danger" feel I want to convey. - A lot of different lighting options. - Don't use the trick of putting his foot on the other side of the ground plane, put it up on a rock or something to include all of him rather than cutting him off at the ankles. Currently living in Bellevue, WA, working as a freelance illustrator.